It’s no secret that using a chainsaw can be dangerous. If you frequently use a chainsaw, privately or professionally, you should be sure to keep safety at the forefront of your mind. The most essential way to do this is to develop strong safety practices as you work. But it is also a great idea to get yourself a pair of decent chainsaw chaps as well as other protective clothing. The best chainsaw chaps can make all the difference – but how can you be sure which are the best, and the ones to avoid? 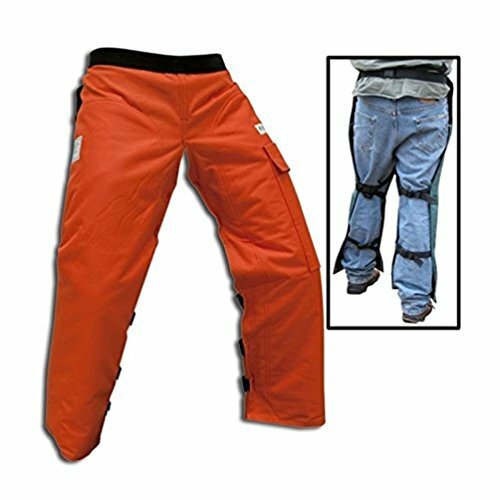 To help you out, we’ve reviewed three popular chainsaw chaps. Which come out on top? Weighing in at 3.3 pounds, these are slightly heavier than other options, but not so much that it will make much difference. They are on the more expensive end of the scale, but as we will see that might be for a good reason. Made of 1000 denier polyester with PVC coating and Tek layers, they have all the layers of protection you’d hope for. Easily adjustable waist size and a particularly comfortable pair for most users. Using these chaps from big brand Husqvarna, you’re likely to feel as safe as anything. They fit well on the waist, thanks largely to the highly adjustable nature of them, but you might have an issue with the leg length. Unfortunately, you can’t adjust for length as well as waist, so if they don’t fit – they don’t fit. You’ll have to turn them up or cut them down. These come with some nice deep pockets, unlike other options out there. The heavy-duty fabric means you won’t find yourself worrying about being hurt. If you slip, these are bound to bring the blade to crashing halt – and that’s exactly what you’re aiming for. That is largely thanks to the high-quality stitching, one feature which really does set this pair of chaps apart. A reflective band on each leg is also a nice touch, and adds a little extra security for professional jobs. They are not too heavy, but still durable, and seem to have an almost magical quality of lasting extremely well over a long period of time. Overall, an extremely well made – if slightly pricey – pair of chaps which offer fantastic protection. It’s just a shame about the leg length. In short, the Husqvarna 587160704 product are some of the best chaps out there offering top-range protection. You’re paying more, but you are absolutely getting what you pay for. If you know you’re going to need a pair of chaps for a long time to come and regularly use motor equipment, these are the ones to go for. If value is what you’re after, you can probably look no further than these chaps. But bear in mind that you are getting less for your money. Even the long ones are not long enough for many users, and you can’t use these chaps with electric chainsaws of any kind because of the higher torque. That aside, they do have their benefits: a nice fit for those who can wear them, a small load at only 3 pounds, and an easy short-term option. These are certified chaps, but you’re unlikely to feel as safe in them as the Husqvarna above. With fewer layers and much less in the way of visibility, you’re definitely not getting everything you might want. They’re light, yes, but only because they’re just not as durable. You also have very little room for adjustment, meaning that if they don’t fit perfectly you’re a little stuck. What’s more, they are definitely not the most comfortable pair out there. Regardless, for the occasional bout of garden chores, they will probably do just fine. You’re not going to grab a pair of Foresters for any long-term or professional work, but if you just want a little peace of mind from time to time you might be happy with the price tag on these. 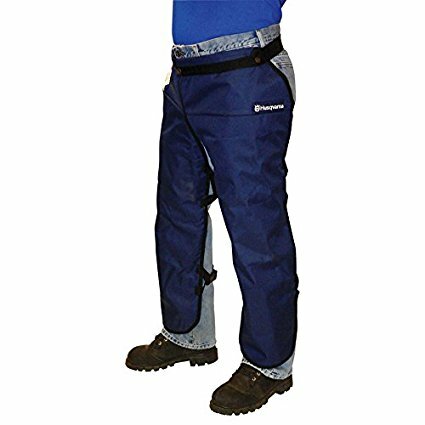 It’s unfortunate the crotch attachment doesn’t seem anywhere near strong enough, causing some genuine safety concerns, and they are also a restrictive pair to wear for longer than about an hour. Most damning of all: if you bend too quickly, the clasp might even come loose – not exactly what you want. You’d be unlikely to go for the Forester chaps and be happy unless you were simply looking for a cheap option for a short-term solution. In all other circumstances, you’d probably be better looking elsewhere for something more durable, adjustable, visible and long-lasting. Back to Husqvarna, and we have another viable contender for the outright winner. 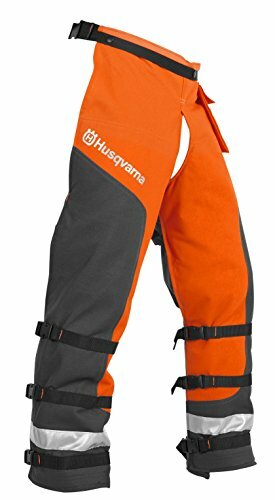 Lighter than the other Husqvarna pair at 3 pounds, great value for money, highly durable with a good visibility, comfortable without being restrictive, and adjustable to boot. These are worth looking into. These chaps offer you a consistent and extremely safe option at good value. With the quality of the other Husqvarna pair, but more like the price of the Forester, they could be a good compromise for many users. They fit the standards, and come in a good range of sizes so you can be sure they will fit. They’re well adjustable too, even down to the flap so you can fit steel-toed boots underneath easily. With 5 layers of protection, you won’t need to worry with these – and although they’re bulky, they come on and off like a charm. If you’re in need of pockets, you might need to look elsewhere, as none in this range have any whatsoever. That being said, they’re a durable and handy little all-rounder at a pretty decent price. You could do much worse. For a good value average-range pair the Husqvarna Apron Chaps are probably a good go-to. They are equally adept at either private or professional work, and durable enough that they will probably last you quite a long time. The lack of pockets is an oversight, but not a major disadvantage, and it’s made up for by the fact that they are one of the most comfortable pairs of chaps out there. You’re getting plenty for your money here. The Verdict: Which are the best pair of chainsaw chaps on test? At least in terms of brand, we have a clear winner, if only because the Forester chaps are nowhere near up to par. If you want a quick and cheap pair, go for those by all means – everyone else will do much better with either of the Husqvarna pairs. While not suitable for use as logging chaps they’re still better than nothing for occasional use in a domestic situation. So which pair of Husqvarna chainsaw chaps? The Husqvarna 587160704’s are a little pricier, but you’re actually getting quite a lot more for your money, so they might be worthwhile. Most importantly they offer strong protection, have much more in the way of visibility and they are the most adjustable pair of the three. The only downside you’re really having to put up with is their bulky size – but they’re only bulky because they have so many layers of protection, which is the whole point after all. The other Husqvarna 531309565’s pair are cheaper, but you get less in terms of specification. Although they too are durable, they have nowhere near as much in the way of security, adjustability and visibility. So overall, it has to be the first pair, the Husqvarna 587160704’s that win out. They are the priciest, but for a very good reason – they are easily the safest, most comfortable pair with the highest visibility. Buy them.